Clementine is the much larger sister to Ruby, our first venue which we opened in 2011 in Hillsboro Village's Dragon Park. Clementine is located on the historic Sylvan-Charlotte district of Charlotte Avenue, directly across the street from Richland Park. After an extensive rebuilding of the 1889 structure, we are now available for private events - including wedding ceremonies & receptions, corporate/ non-profit parties, and music occasions. 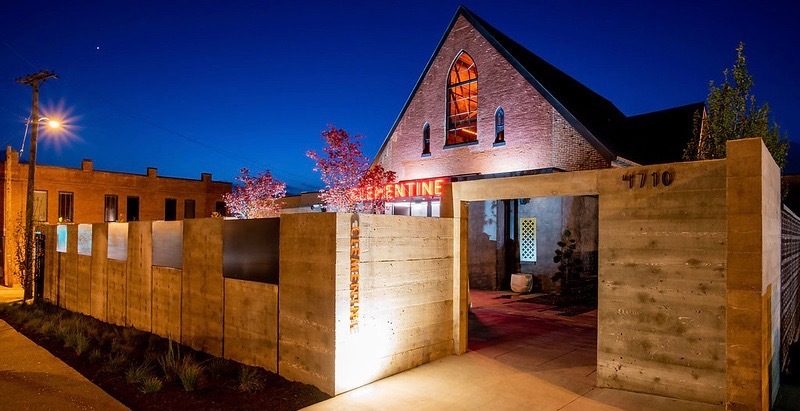 Clementine blends the historic with a polished industrial, contemporary design and an appreciation for outdoor spaces. For those of you like us, you may want to look at our history. Stunningly beautiful historic bones married with a complete boutique design rebuild of the space. We eliminate the fundamental venue dilemma - choose a venue that is safe but institutional or inspiring yet raw. Clementine is an old beauty with surprising vigor. A la carte events do not have to be more difficult to plan than those all-inclusives. We make bespoke easy. Go ahead, break the event mold. It'll be better than okay. Broad vendor latitude married with thoughtful curation. It's is how we maintain a good measure of freedom balanced with our years of event wisdom. Your result will be a singular boutique experience. It begins with our location opposite a Nashville park. Entry is trough an expansive walled courtyard that is a contemporary urban oasis. The outdoors has always played a significant part in our events, as we hope it will yours. Let's see.